It should be noted that the scientific critiques in this volume are not new. The beauty of this project is distilling them into one volume. Even if some readers will not be completely convinced by the scientific critique in these chapters, the reader is given much food for thought. At the very least, a byproduct of this section is showing that the scientific position of TE suffers from being ill-defined and nebulous. There is no agreed upon scope of the evolutionary process and no clear definition of the term itself. Indeed, some have criticized this volume’s definition of TE as not being accurate. But since the definition in the book is based on referenced quotes and statement by major proponents of the position, it would seem the bigger issue is with TE itself. More. Theistic evolution is best seen as a way of maintaining non-naturalist traditions, including Western religions, whie accepting naturalism (nature is all there is). Theistic evolutionists would be the last to notice the problems that are currently engulfing naturalism. Which is a ty because that is the real story today. Does lack of a good father figure promote atheism? William Lane Craig: Is there meaning to life? The Pope critiques God’s Word, huh? Some uncharitable persons might suspect him of arrogance. Am I a theistic evolutionist? Here is what I believe: (1) the age of the universe and the earth are what science says they are– several billions of years old. This is virtually beyond a shadow of a doubt. >(2) Descent with modification. Consider for example, dogs. There are several breeds of dogs: German shepherds, St. Bernard’s, Cocker spaniels etc. There is no doubt that the different breeds of dogs vary widely in size and appearance. Furthermore, according to Wikipedia, our domestic dogs are members of the genus Canis which “includes the dog-like carnivores: the domestic dog, wolves, coyotes and jackals.” Dogs, wolves and coyote are classified as different species, however, some domestic dogs can interbreed with wolves and wolves can interbreed with coyotes. As Darwin noted in the Origin of Species this an example of artificial selection (in the case of domestic dogs) and natural selection in the case of the broader canis genus. Scientifically I consider this very well established. Indeed, not even the most YEC would argue the Cocker spaniels were specially created. However, when it comes to extrapolating this process all the way back I’m skeptical. It is yet to be established that natural causes are sufficient to explain so-called macro-evolutionary change. Even staunch evolutionists like the late Stephan J. Gould and Richard Lewontin have chided their colleagues for relying on just-so stories. But why are their colleagues relying on just-so stories? Because apparently that’s all they got. If that’s true then what’s the argument for macro-evolutionary change? We believe it, therefore, it’s true? Why not be honest and just admit that “we don’t know”? Obviously if you don’t know you’re relying on your philosophical world view. Lewontin concedes as much in his now infamous NYT book review of the late Carl Sagan’s The Demon-Haunted World: Science as a Candle in the Dark. But that’s just bait and switch. Aristotle coined the term metaphysics and metaphysics is not science (or at least what we term science today.) However if you are going to allow metaphysics a place at the table doesn’t that mean you need to reserve a place for ID, or even creationism? By the way, a couple proponents of ID Michael Behe and Michael Denton accept common descent– a view that Darwin himself championed. But because they question the neo-Darwinian mechanism to explain evolutionary change they are dismissed as heretics… The neo-materialists are just a dogmatic in their thinking as the YECs are in theirs. Personally I am not convinced common descent is true– though I can’t rule it out as being logically impossible. My position then is somewhere in between the two extremes (and close to the middle) YEC and unguided “blind watch maker” evolution. At the very least I am very sympathetic to some form of ID. It explains a lot of things a purely naturalistic hypothesis cannot. I am a theistic evolutionist. (1) the age of the universe and the earth are what science says they are– several billions of years old. The age of the earth depends on how it was formed. The 4.5x billion years depends on the untestable assumption that all accretion debris was thoroughly melted. If that didn’t happen then the age is of that debris and it says nothing about when the earth was formed. The age of the earth (or universe) is not the topic of this thread. I am simply stating where I agree with the science. I am simply stating where I agree with the science. For those who are not familiar with the Lewontin quote, (btw what’s been happening on Mars?) here it is for the nth time. The evolution in nature is not opposed to the notion of Creation, because evolution presupposes the creation of beings that evolve. As it stands, we have found no such beings. 1. Theistic Evolution relies on the assumption that Darwin was right. Without that, there is no Theistic Evolution. Conversely, Theistic Evolution could not be invalidated by any philosophical or theological analysis if Darwin were right. In addition, the science, philosophy and theology (religion) separation is imaginary as shown. At close to 1,000 pages, the book is way too big, and should be split in two or three volumes. To make it more effective, an even better alternative would be to focus on the scientific argument with way fewer chapters dedicated to philosophy and theology. And in that case, Darwinism and not Theistic Evolution would be the real subject of the book (as is always the case). 2. Given the number of different perspective one can view the subject, it makes perfect sense that this book is a collaborative effort. The downside of this collective work is that not all views fit well together to create a unified message, but this is mitigated by the nice structure of each chapter that starts with a summary, continues with clearly defined subsections and ends with a conclusion. 3. Too bad the authors refer several times to Judeo-Christian ideas showing an unnecessary, restrictive regional bias. Without one bit of extra effort, they could have discussed about the Abrahamic heritage instead, and Intelligent Design is even more inclusive if one is willing to research other cultures. This omission can be corrected in further editions and does not alter in any way the analyses and conclusions presented. 1. Theistic Evolution relies on the assumption that Darwin was right. Without that, there is no Theistic Evolution. Conversely, Theistic Evolution could not be invalidated by any philosophical or theological analysis if Darwin were right. Yes, even more. We know that Darwin (or “evolution”) cannot be falsified really. So, TE is a very safe position. It really just accepts anything that is called ‘evolution’ – Darwin or otherwise. Today there are some hard-core Darwinists who are TE, but many just back away from the science – willing to accept any materialist claim for science, holding (what they think is) a trump-card of God behind everything and anything that is proposed. Others, like Ken Miller have sold themselves entirely to Darwin, to the point that they invent their own theology so God will fit into the picture somehow. At close to 1,000 pages, the book is way too big, and should be split in two or three volumes. Interesting. Yes, I find it hard to imagine how anyone could get 1,000 pages on this topic without repeating a lot. 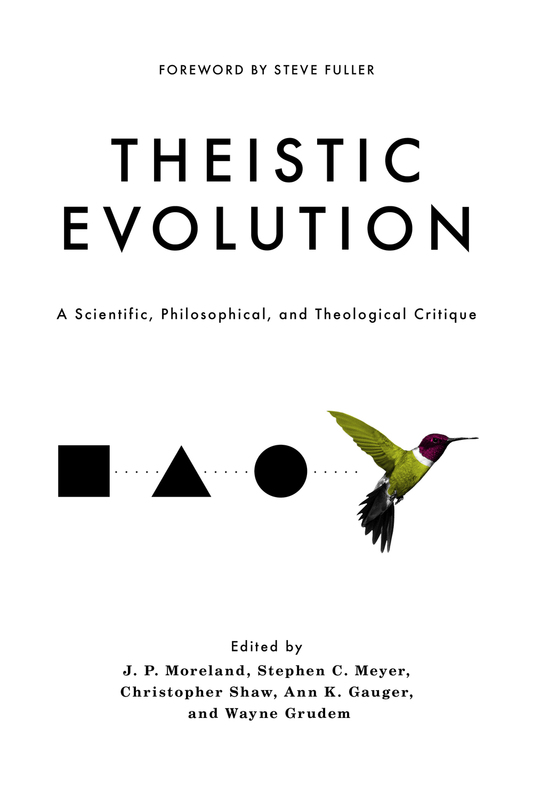 But then again, as pointed out, if the book critiques Darwinism, as it should in my opinion, then it is worth that kind of detail. To make it more effective, an even better alternative would be to focus on the scientific argument with way fewer chapters dedicated to philosophy and theology. If the book is an ID perspective, then science should be the only focus. IDists have no claim to theological or philosophical expertise – or even to a consensus in those views. I don’t know how TE can be criticized theologically unless it is from a unified theological position. And in that case, Darwinism and not Theistic Evolution would be the real subject of the book (as is always the case). Yes. Very good point. I take it farther – it’s really a materialist/atheist story of origins that should be the subject. How that is incompatible with theism. Because, as we know, Darwinism can be shown to be totally absurd and false but its adherents merely can move to an “extended synthesis” of the falsified theory, or come up with an entirely different set of materialistic mechanisms. They don’t really need Darwin, as such. Just some kind of story of blind, mindless forces in the universe as the substitute for God. The downside of this collective work is that not all views fit well together to create a unified message, but this is mitigated by the nice structure of each chapter that starts with a summary, continues with clearly defined subsections and ends with a conclusion. Again, if the book contains different theological perspectives then why condemn TE which is just another theological perspective? If the authors are ecumenical with tolerance for various and contradictory faith-proposals, then I wonder how they agree that they, together, are correct about theology and TE is not correct. Too bad the authors refer several times to Judeo-Christian ideas showing an unnecessary, restrictive regional bias. Without one bit of extra effort, they could have discussed about the Abrahamic heritage instead, and Intelligent Design is even more inclusive if one is willing to research other cultures. Yes, if the authors do not understand that ID is independent from and compatible with any variety of Faith traditions, and in fact, ID is compatible with some forms of atheism – then the book is essentially useless in my view. I will admit, that most people who promote ID have a single faith tradition (Evangelical Christianity) that they hope will be supported by ID. They use ID as an apologetic for Protestant Christianity, at the same time, cleverly saying that “ID is just science”. Well, we can’t have it both ways. If ID is “just science” – then it can be used by any or even No faith traditions and get the same results. Other IDists require that science itself has to change in order for ID to be accepted as science. But that seems wrong and absurd to me. “ID is just science (as long as you accept an entirely different view of science than mainstream science does).” That seems dishonest. If one must create a new or different idea of the scope of science, in order to accept ID as science, then the statement “ID is just science” is not accurate. If ID is a religious position – then honesty requires it to be presented as such. If ID fits within secular science, as science is practiced today, then ID is not an apologetic for any one religion. It is just science – and people can draw whatever theological conclusions they want from it. ID has nothing to say about the theology or even the philosophy. All of that seems to be ID and anti-materialist sort of stuff and has nothing to do with a critique of Theistic Evolution as such. This assumes that the authors of the book are competent in their interpretation of the Bible and that there is some reason why anyone would need to pay attention to what they have to say. An interpretation of the Bible comes from a Faith tradition – that is, a religion. I think a full-scale attack on TE, complete with theological propositions, from the ID camp is an indication of despair and loss-of-mission from IDists. I believe the real engagement with atheistic science has been diminished and lost — not because ID has failed, but because ID has been successful! But this success for ID has just silenced Darwinism, and pushed open arguments into the dark and closed world of academia. In the past decade, I’ve seen much less open hostility towards ID from all sides. The hostility and opposition is still present, maybe even worse, but it is not expressed as openly and as rashly as before. One reason, some will suggest, is that atheistic-science has totally dismissed ID and no longer takes it seriously. I very much doubt that. I think ID is known to be a strongly held position against Darwin, and quietly, more people accept ID. Stephen Meyer’s books and arguments, for example, continue to hold up well and have not been refuted. They have not even been adequately analyzed by Darwinian-opponents. I see this as a victory for ID, and a collapse for Darwinism. I mentioned that Ken Miller “invents his own theology” — but that’s what people do. On what basis do IDists claim that their theology is better? Is there a religion that ID wants everyone to believe in? Good analysis on your site. It’s difficult to argue against any of that. The fact that evolutionists will just shift the argument and change the theory, does indicate to me, that the whole thing is a fraud. But at the same time, a supposed theory that predicts nothing and makes no fixed claims, cannot be falsified. For example, gradualism. Yes, that should be a cornerstone for Darwinism. But going back to S.J. Gould – ‘evolutionary theory’ remains unaffected even if gradualism is proven false. So there can be bursts of innovation followed by stasis, and Darwin supposedly remains correct. But that’s just mythology – a materialist creation story, where blind, undirected forces cause things. No matter how they are caused, the evolutionary mythology just posits this invisible god of materialism that creates all the diversity of life.